Great looking car....they should bring to NA. It'd compete nicely w/ the 3, A4, Q and a bunch of others. It looks like a 3 Series from the side, with an even smaller greenhouse. Is there a point where car manufacturers will figure "we can't make the side glass any smaller," or will they shrink it down to a mail slot? 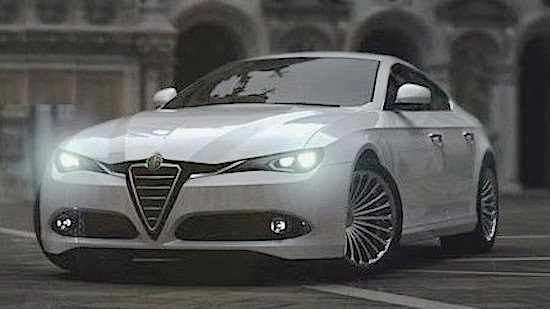 If this does turn out to be a midsized RWD Alfa sedan, the only way to meet economies of scale would be to share the platform with Dodge.. and could easily form the basis of a new Avenger, and even the next Challenger if it could handle that kind of power.. which could also allow it to be stretched for the next Charger and 300. I see lots of potential here, even if the illustration is optimistic. I don't know......This illustration reminds me a lot of the new MG sedan with a Alfa grill pasted on the front. I hope the real thing looks more interesting. Nice looking chop. If Alfa can do better they'll have made something pretty nice.